Scouts BSA have many opportunities at the Lawhorn Scouting Base. Below are some of the outdoor activities that you can participate in. As always, the staff at the base are ready to help you plan an activity that your Scouts will remember for many years to come. 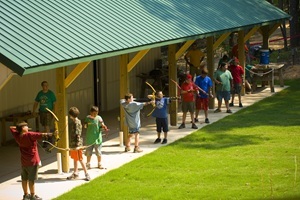 The traditional Scouts BSA resident camp at Lawhorn. Camp Thunder offers more than 55 merit badges, the premier Buckskin first-year camper program, Pathfinder 2nd-year camper program, and our famous Mountain Man pioneer experience. The premier high-adventure base on the East Coast! Specializing in climbing, COPE and canoeing, the adventure area is open year-round. You can join the staff at the Lawhorn Scouting Base for a camping experience during the winter. You will find over 30 merit badges, high adventure programs, and activities that can only be done in winter like the Polar Bear Swim and Out Cold.